This article was adapted from the SONAR Hopkinton Update PDF. 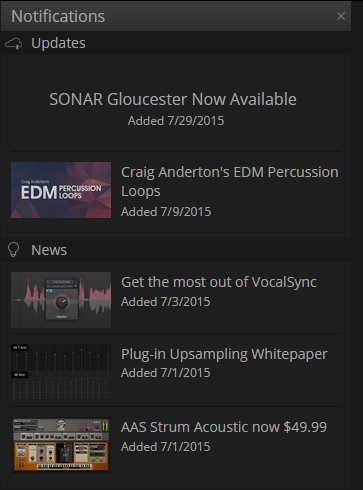 Open the Cakewalk Command Center, then download the core SONAR Artist, Professional, or Platinum category. Please note that a Command Center 1.1 was introduced during July; please update to the latest version if you haven’t already done so. SONAR’s new Start Screen is designed to connect users to SONAR through a screen that’s helpful, engaging, and doesn’t intrude on the creative process. Its main goals are to provide a more efficient way to find and open projects, as well as offer notifications. The notifications “bell” in the upper right shows the number of unread notifications, so you don’t need to click to find out if there’s anything new. Notifications include update announcements of, links to new blog posts, Cakewalk-related news, limited-time offers, and the like. Most notifications have clickable links to take you to the appropriate screen. For example, if you click on the notification that indicates there’s a new update, you’ll be taken to the Command Center. Starting a project and working on music is the Start Screen’s top priority. The left side of the Start Screen shows various options; selecting one populates the center with possible choices. New Project opens the default template from the enhanced Templates screen. If you want one or more of these to remain available regardless of when they were opened, click on the pin button in the project slide’s upper left. The thumbnail is a snapshot of the project’s state when it was closed, which can be helpful in confirming this is the project you want. To show project info (when last modified, when created, tempo, sample rate, and time signature), click on the Info button in the lower right. You can launch the project from the info window, by clicking on the project thumbnail, or clicking on the project name. New from Template is an upgrade from the former “template laundry list.” Hopkinton includes new types of templates including Mastering, Mixing, and Showcases. Note that it’s also easy to “favorite” a template: click in the template image’s upper left corner; the star indicates which template will load when you select New Project. For more details, see the section on templates. Existing Project opens the Program Files/Cakewalk Projects folder using the original “File Open” dialog so you can choose any project in the folder. Video Tutorials populates the center screen with a variety of “how-to” and tip-oriented videos. The Quick Tip section in the lower left rotates among various tips and also may include some thought-provoking quotes. Reading the tips is a painless way to gain a little more SONAR expertise every time you open the Start Screen. If you’re in a hurry, type Ctrl+N to open the favorite template immediately, without seeing the Start Screen first. However, this requires creating a project folder manually when you save; see New Preferences for details. File > New opens the New Project File dialog box introduced in Gloucester where you can specify project parameters such as Meter, Tempo, Bit Depth, and Sample Rate, as well as access a template using the standard file selector. File > Open opens the Program Files/Cakewalk Projects folder. File > Revert shows a list of saved versions so you can “roll back” to a previous version. File > Start Screen opens the Start Screen. You can control SONAR’s behavior when starts up with additional preferences under Preferences > File > Advanced. To open SONAR to an empty project and choose what you want from the Start Screen, uncheck “On Startup Load Basic Template” and check “Show Start Screen on Launch.” This provides the greatest flexibility on startup. To always open with your favorite template and bypass the Start Screen, check “On Startup Load Basic Template” and uncheck “Show Start Screen on Launch.” Because you don’t have to name the project, this offers the fastest way to get started if you usually start with a template. However, note that in this case file management is under Windows and not SONAR, so to create a per-project folder you’ll need to create a folder and choose it when saving. This is also the case if you create a new project by typing Ctrl+N. To get you started making music faster, Hopkinton includes several new templates including Mastering, Mixing, and Showcase templates. These six templates come pre-loaded with their respective mastering FX chains (see the Mastering FX Chains section for more information), designed by Dan Gonzalez. The Mix templates (one each for Rock, Pop, and Hip Hop) have track/bus names and icons for common projects in various genres. The Showcase Templates highlight particular SONAR features, facilitate songwriting, or make it easy to check out particular effects or FX chains. Furthermore, if you encounter an effect or instrument you like, you can save it as a track template and use it in any of your projects. Here are details on the various showcases. Amps: Loads ten tracks with effects based around Overloud’s TH2 amp sim. CA-X Amps: Loads 12 tracks, each with its own CA-X custom guitar amp. CA-X Bass: Loads 11 tracks, each with its own CA-X custom bass amp, and five more tracks with individual effects. Drum Loop FX: Loads empty tracks populated with 16 drum-friendly effects and FX Chains—drag some drum loops in to hear how these effects can process the sounds. Electronic: Loads six synth-oriented patches based around the Cakewalk Sound Center, and two around the SI Bass instrument. Keys: Loads 12 tracks of popular keyboard sounds, ten from the Cakewalk Sound Center and two from the SI Piano soft synth. Orchestral: Loads the TTS-1 multitimbral synth, pre-programmed with 16 orchestral instruments—just select a track, start playing your MIDI controller, and you’re ready to write some music. Pop: Loads the TTS-1 multitimbral synth, pre-programmed with 16 common instruments used in pop music. 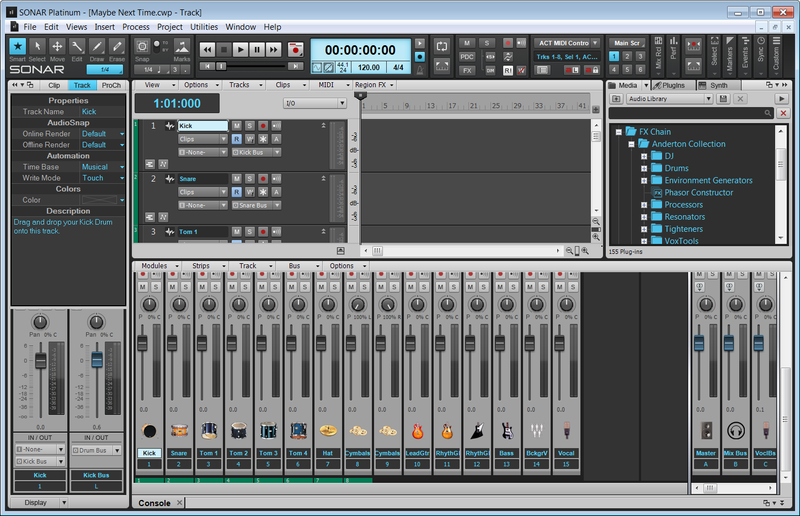 As with the Orchestral template, select a track, and start playing. Songwriter: Five tracks with virtual drums, bass, and piano, along with audio tracks for acoustic guitar and vocals (with appropriate effects in each track). Vocals: Loads 16 tracks, each with effects tailored for voice. 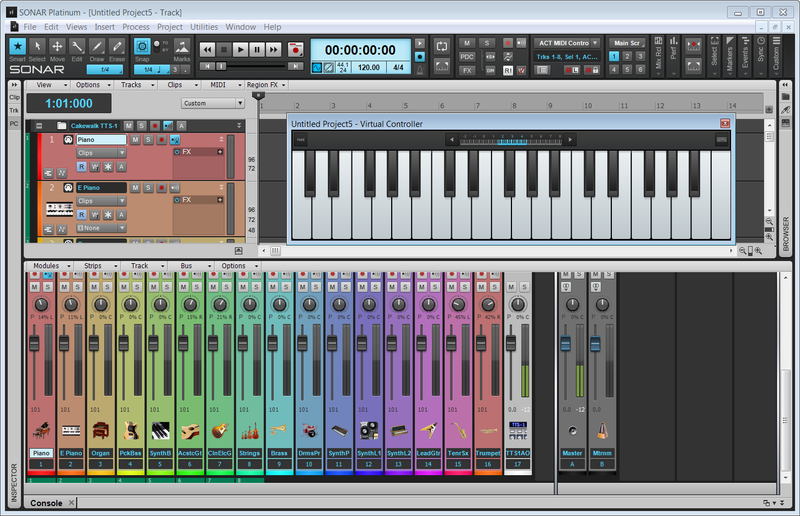 The Pop template for songwriting features 16 different instruments. These mastering FX chains complement the new Mastering Project Templates. While they’re optimized for stereo mixes, as usual with recording there are no rules—feel free to try these with individual tracks as well. Remember that the input levels to these processors will impact the sound considerably; if the mix is hot, you’ll probably need to start with any “Louder” control pulled down a bit, and you’ll get more compression than if the mix has a fair amount of headroom. The control settings provide a good point of departure, but don’t be afraid to tweak the parameters to match the mastering to your music. A single soft-knee compressor provides 6.5 dB of gain, but the output limiter is enabled so the sound stays clean. The Attack and Release settings have been stylized for a smooth character; adjust them to taste. For more compression, drop the Threshold and if needed, raise the Louder control to provide makeup gain. Note that while the Limiter can keep levels under control, you can push it only so far—if the audio starts pulsing or rushing, turn down Louder. A hard knee compressor pulverizes the incoming audio signal the more you turn up the Aggressive knob. Once you’ve nailed the character, then drop the threshold for even more compression on your mix. The “Brighter” button defaults to on, and adds an element of “air” to your mix. This Mastering effect is ideal for dull and boring mixes, and depending on the other control settings, you can often get away with turning up the Louder control so the processed version is quite a bit louder than the unprocessed version. This is the quintessential compressor processor for take-no-prisoners mastering. There are two compressors in series: the first one mashes down outlying transients, while the second one adds a smooth finish to your master. The default settings are pretty extreme, so use Tighten and Aggression to find the best character, then boost the overall signal with the Louder knob. As an added touch, the Brightness switch banishes dullness if needed. Does your mix sound, well, strange? This FX chain boosts and cuts in all the right places, with a Drive button and Tighten control to add character. Note that you’ll probably want to start off with the Louder control around 50%, and be careful about turning up too far—or the output limiter will complain and start to stutter. Add some focus to the sub frequencies, and your master should start to sound like record. This is based on a soft knee compression-based architecture that widens and smooths out your master. The Smooth and Aggression parameters can add excitement with the added benefit of a Width button which, when activated, spreads out the stereo image by 150%. This FX Chain offers both a Width control and two Tighten parameters to simplify the mastering process. 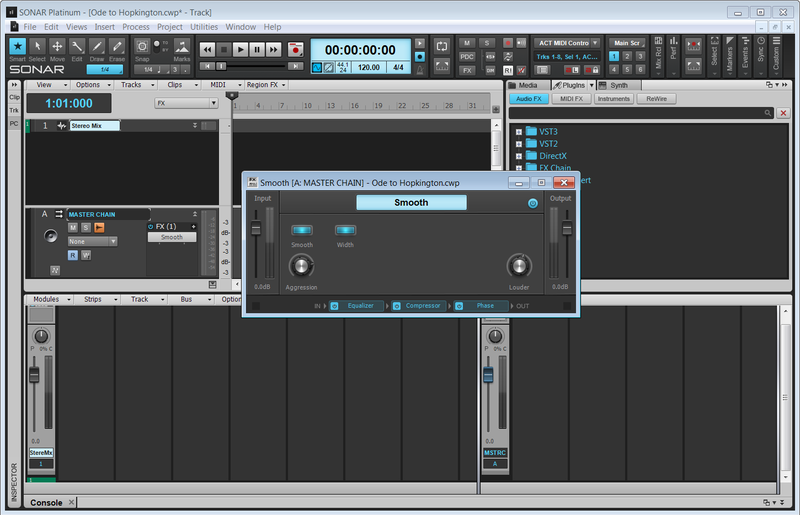 Add a bit of Tighten 1 for some control, and then a bit of Tighten 2 to completely crush your mix. The Hopkinton fixes and workflow enhancements are available in their own knowledge base article.